Is the magnaspread right for you? BBI Binary(TM) Manifold Precision Agriculture Ready, Advanced Technology for the most sophisticated farmer, Spreads lime at up to 2 tons per acre at 14 mph with a 60' swath, Spreads fertilizer in 80' plus swaths, Spread your fields when you are ready to spread. Advanced Technology for the most sophisticated farmer! Spread your fields when you are ready to spread. UHMW Bearing Back keeps bearings clean, resulting in longer bearing life and fewer failures. 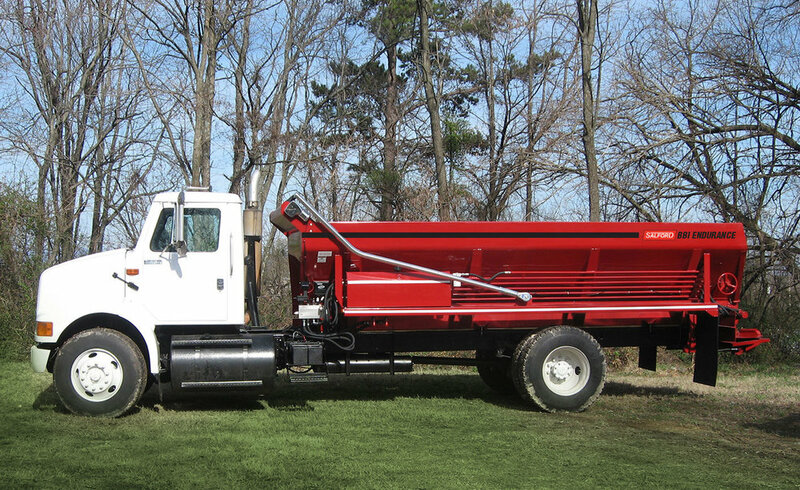 BBI Spreaders are " Option Rich" and can be customized to your specific application. Electrostatic Paint - Carbon unit is totally primed with a rust-inhibiting alkyd primer and then top-coated with high gloss enamel. Stainless unit includes all mild carbon steel parts primed and painted. Standard paint color is red, other colors available upon request. Hydraulic Power Source- Hydraulic power to the spinners and conveyor is supplied by a two section hydraulic pump driven by truck PTO. The hydraulic oil reservoir is specially designed and formed to allow extra cooling area. The reservoir is equipped with a large filler / breather assembly, sigh level guage and oil temperature guage. The reservoir has a capacity of 35 gallons to keep oil temperatures down, thus increasing hydraulic components life. Conveyor Drive - Spur-Gear drive Reduction Box with 2" diameter output shaft and direct drive Low-Speed / High-Torque Motor(s). Equipped with flow control valve at front of oil reservoir to increase, decrease, or stop conveyor, independent of spinner system. Electronic Control - The Tee Jet CL250 is included in the List Price. The CL250 provides straight rate control with guidance. BBI Binary TM Hydraulic Manifold System for MagnaSpread - Combines the hydraulic controls for the conveyor and spinners into one control manifold. It includes proportional manual speed control for both spinners and conveyor. Pilot operated relief is standard. A dump valve and a GR is standard for the conveyor, The modularity of the BBI Binary Valve allows for quick easy conversion to GR option and to electronic control. Standard: MagnaSpread Spinners - offers true driving intervals to reduce swath overlap. 60 ft Lime, 80 ft Fertilizer. 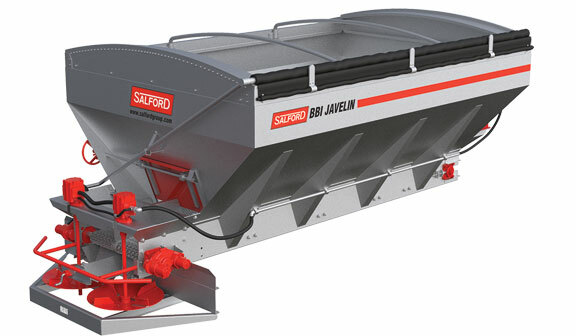 Optional: Javelin Spinners - offers the widest swath for urea in the industry. 120 ft Urea. Throw material in a full swath, to the left only, or solely to the right of the spreader, using split conveyor chains and independent spinner control. 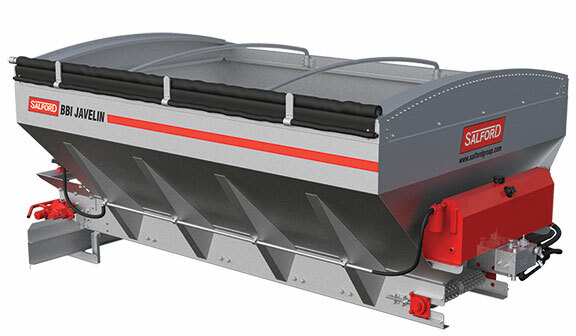 Multi-hopper spreaders can be used to vary the rate of N, P and K in one pass, with higher accuracy in fewer passes. Multi-hoppers can also be used to blend multiple fertilizers, micronutrients and/or cover crops. We’re very surprised and impressed with how simple it is to setup. It probably took us about 10 minutes to calibrate each box on that spreader. It has 3 separate hoppers on it and we could spread 3 different products with it. With one person it took about 10 minutes a box to calibrate it, and with two people, you could do it in less time. I was very pleased with the machine. It’s well-built, and I think if you had any issues with any components, it’s all very easy to get at. Everything is out in the open which made service easier. When you’re all done with it, or if you’re not going to use for a few days, it’s very easy to clean up with the way that everything is out in the open. It’s quite simple and we’re pleased with that aspect. And the quality of the material is very good. I’m really impressed with the uniformity... it spreads 80ft. wide and it overlaps very little, and the amount it does overlap, you really have to check closely for. It’s been quite uniform across the whole 80 ft. We have some fields that have quite a bit of variability. I’ve walked over it and I’m very impressed with the uniformity of the spread on this machine. As time goes on we’ll see the long term performance of this unit but like I say, it’s well-built, the material is all heavy on it, and I don’t foresee any problems with it. 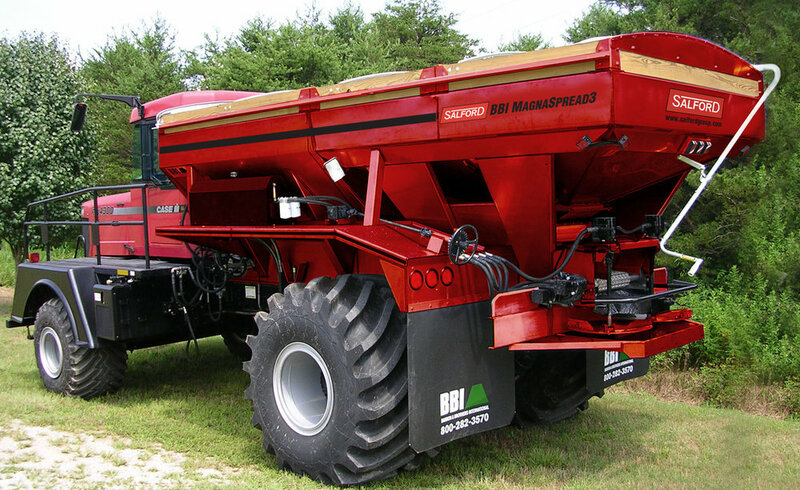 The majority of the spreader is stainless steel. As long as we maintain it and take care of it, it should last a long time.